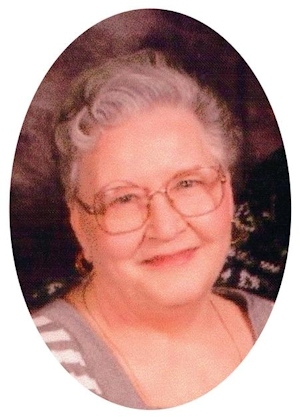 Obituary – Williams, Clara Edith (Herrian) « Perry High School Alumni Association, Inc.
Clara Edith Herrian Williams, 76, of Perry, Oklahoma was the daughter of James Jim Russell and Ethel Mae Cutter Herrian. She was born October 19, 1936 in Lela, Oklahoma and died Sunday, May 12, 2013 in Perry, Oklahoma. She married her best friend and sweetheart, Raymond Ray Neal Williams on January 20, 1951 in Perry, Oklahoma. They were married for fifty six years. Ray preceded her in death on May 31, 2007. Clara enjoyed cooking, crocheting and reading but most of all she loved spending time with her family and friends. She was an active member of the Church of the Nazarene in Perry, Oklahoma where she baked cinnamon rolls for each new family that joined the church. Her closest friends were her church family and her pastors, past and present. They have all played a vital role in her life and she enjoyed spending time with them. Memorial services will be held 2:00 p.m., Sunday, May 19, 2013 at the First Nazarene Church, in Perry, Oklahoma. Rev. Steve Smith will officiate. Services are under the direction of BrownDugger Funeral Home. Memorials may be made to the First Nazarene Church in care of BrownDugger Funeral Home, 1010 N. 7th Street, Perry, Oklahoma 73077. Clara is survived by two daughters, Sandy Ellis and her husband, Butch and Mary Hunt all of Perry, Oklahoma one son, Jimmy Williams and his wife, Connie of West Point, Nebraska five grandchildren, Tracy Hughes and his wife, Dawna of Tonkawa, Oklahoma, Deidra Hughes of Muncie, Indiana, Justin Hughes of Perry, Oklahoma, Rusty Ellis of Stillwater, Oklahoma and Aleasa Ellis of Perry, Oklahoma nine greatgrandchildren, Bailey Hughes and Parker Hughes both of Tonkawa, Oklahoma, Ki Hughes of Perry, Oklahoma, Braelynn Dennis and Jadynn Dennis both of Muncie, Indiana, Daysia Ellis of Perry, Oklahoma, Bryce Ellis and Aiden Ellis both of Blackwell, Oklahoma, Mason Ellis of Perry, Oklahoma. She was preceded in death by her husband, Ray Williams her parents, Jim and Ethel Herrian one sister, Virginia West one niece, Janet Ruckman one nephew, Dennis Herrian and one grandson, Neal Ellis.